Assuming you've managed to escape any feelings of "Wonderlust" that may have set in with the passing season, the Rabbit Hole Brewing Company now seeks to lead you into the Season of Fear. Ruled by the Red Queen, a character from author Lewis Carroll's story Through the Looking Glass, the Season of Fear is one that inspires beers of greater strength. Carroll once described the Red Queen as someone who exhibits a kind of controlled fury, something seemingly to be in abundance in Rabbit Hole's soon-to-be newest offering, Off With Your Red. 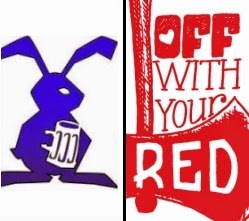 "Off With Your Red is an aggressively hopped red IPA befitting its status as the first release of the Rabbit Hole Brewing 'Season of Fear.' The substantial malt backbone establishes the dark ruby/garnet color and supports the significant flavor and aroma additions of American Pacific Northwest hops. The hop nose is bright, resinous, and lingers to the end. At 7.9% ABV and 88 IBU, Off With Your Red is not to be trifled with; if you do, you may just lose your head." Also note that the brewery has special glassware in the works to commemorate the release. Sixteen-ounce shaker glasses will sport the 2014 Season of Fear logo (along with that of the brewery), while thirteen-ounce snifters will feature Off With Your Red regalia (only 500 glasses made). Check local event listings to find out where and when these will be available.